The Java Development Kit, version 1.6.0 or newer. Eclipse, including the JDT. Either the “Classic” or “Eclipse for Java Developers” is sufficient. Scala IDE v3.0 can be installed on both Eclipse 3.7 (Indigo) and Eclipse 4.2 (Juno), through different update sites. If you are using Eclipse 3.7 (Indigo), we recommend the latest 1.6.x version, because there have been issues reported when used with Java 7 (e.g., , or  if you are on MacOSX - a workaround for the latter issue is described here). Eclipse 4.2 (Juno) has full support for Java 7. We recommend to use the latest Eclipse 4.2 SR2 release which contains several performance improvements. 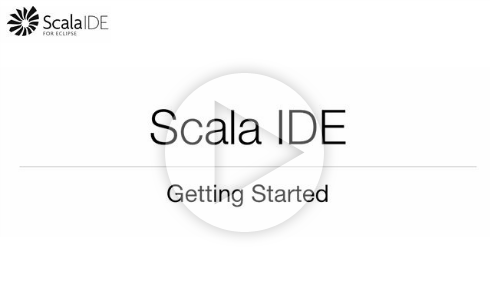 The getting started screencast provides a more visual explanation on the installation and the first steps with Scala IDE. Scala IDE for Eclipse is best installed (and updated) directly from within Eclipse. This is done by using Help → Install New Software..., add the Add... button in the dialog. Choose a name for the update site ( Scala IDE is an obvious choice). Then read the next section to select which version you will install. For Scala 2.10: provides support for projects using Scala 2.10 (any minor version). This is the current version of Scala. Pick this one if you are unsure. For Scala 2.9: provides support for projects using Scala 2.9 (any minor version). If you want to live on the bleeding edge (i.e., using the development stream for Scala and Scala IDE), check the nightlies section to find the one that fits your needs. The version of Scala used inside Scala IDE cannot be chosen per project. So, if you want to work with a project using different version of Scala (like 2.9.3 and 2.10.1), you need different installation of Scala IDE. Copy the URL as location and hit OK to validate. Select Scala IDE for Eclipse from the list of available features. If you want to install any additional plug-ins (this step is optional), expand the Scala IDE plugins category and select the plug-ins that fits you best. Go through the next screens to validate the list of plug-ins to install, the License and start the installation. After having restarted Eclipse, Scala IDE is installed. For a more fine-tuned setup, check the Advanced Setup page. You have successfully installed the Scala plug-in, and you can now import your favorite project. Before you begin, make sure your Scala sources follow the Java convention for packages. Each package should appear in its own directory with the same name. Eclipse expects this convention to be followed when it looks for classes. sbt is the standard build tool for Scala projects. There are two versions in wide use today: 0.7.x and 0.10+. Both have plug-ins that can generate Eclipse project files out of the sbt project definition. If you are using sbt 0.7.x, use eclipsify. Follow this instructions to install the plug-in. You may want to check out the update-sources plug-in, which can download attached sources for your dependencies. This allows you to navigate through the libraries source in the IDE. If you are using sbt 0.12.x, use sbteclipse. Follow the instructions on the project page to install and use the plug-in to generate the project definition. sbteclipse can download attached sources natively, so you do not need the update-sources plug-in. Once you have installed and generated the Eclipse project files using one of the above plug-ins, start Eclipse. Use File → Import → General/Existing Project into Workspace. Select the directory containing your project as root directory, select the project and hit Finish. And Voila. sbt manages the dependency to scala-library.jar. Make sure the version of Scala you use in your sbt project matches the version of Scala installed in Eclipse. maven support on the Eclipse platform is provided by the m2eclipse plug-in. Because of some specificities of Scala, m2eclipse-scala has been created as an extension to m2eclipse to provide better Scala support. To install the latest version of m2eclipse-scala, use the update site at this location: http://alchim31.free.fr/m2e-scala/update-site/. After installation, maven projects can be imported using File → Import → Maven → Existing Maven Projects. Check the Known Issues section.